CCOM’s Summer Undergraduate Research Fellowship (SURF) program is designed to create research experiences for undergraduate students who are interested in pursuing graduate work. SURF is aimed primarily at students who are working toward a degree in science, engineering, or math and are completing their junior year. S tudents accepted into the program will spend up to 10 intensive weeks (normally early June to mid-August) working under the guidance of a CCOM faculty member. They will conduct research related to acoustics, bathymetric mapping, habitat mapping, lidar, marine geology and geophysics, optical imaging, sonar signal processing, or data visualization. Research activities may include laboratory experiments, field work, a research cruise, data analysis, model development, or instrument development. The research conducted by all fellows will be presented to CCOM at the end of the summer, and summarized in a written report. a stipend, on-campus room and board, and travel assistance. Submissions should be in PDF format and sent to surf@ccom.unh.edu. Applications must be received by March 1. Applicants will be informed of the selection committee’s decision by April 1. Airborne Lidar Bathymetry (ALB) is an optical remote sensing technology that is used for measuring shallow-water bathymetry. Although the system is widely used by governments and survey companies around the world, the contribution of environmental factors on the ALB measurements are not fully understood. In this SURF internship, the interaction between the ALB measurements and the water surface, water column and the seafloor were characterized through experimental procedures and theoretical simulations. Three experiments under different environmental conditions were conducted using a lidar simulator to measure and quantify the received ALB waveforms. The experiments investigated the accuracy to measure distance using the simulator, the expansion of the laser beam through air and water, and depth measurement in very shallow waters (< 2 m). Preliminary results show that the distance calculated from the ALB waveforms differs by 4% from the true distance. At shallow water the two response pulse functions merge together. The preliminary results were not able to characterize the water column. This may be due to the narrow field of view of the detector unit. Also, the beam divergence expansion underwater did not match the theoretical measurements due to hardware configurations. Improvements can be made with respect to the capture threshold of the camera being fixed, would allow for a better measurement. Also employing a time varying gain could make it possible to attain distance measurements for greater distances. "This SURF program was an overall wonderful experience. It fostered intellectual growth while maintaining a friendly environment. Learning about the CCOM facility has influenced my decision to continue my education in graduate school. Aside from getting to know my SURF advisor, I was able to get to know the other SURF students who were working under other advisors. These friendships I have made through this program have continued through the academic year. The SURF program offered by CCOM was a wonderful experience that I would recommend to anyone interested in getting involved in aquatic research." 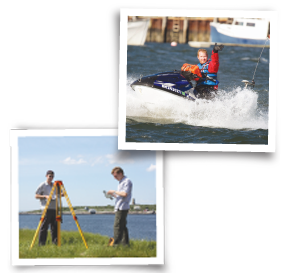 Acoustic backscatter tests were performed with a SIMRAD EK60 Split-Beam Echo-Sounder (SBES), and a RESON SeaBat 7125 Multi-Beam Echo-sounder (MBES) at the University of New Hampshire’s Center for Coastal and Ocean Mapping. The tests were conducted during the summer of 2012. These tests were done in order to investigate the angular and range dependency of the Scattering Strength coefficients of a test target in order to validate its use in Sonar testing. An extended jack chain target was used due to its characteristic similarities to the seafloor. The target was moved to various positions relative to the SBES and measurements were recorded. Twenty individual chain links were tested by rotating each link 360 degrees, in 10 degree increments, with the EK60 pinging twice per second. This test provided an average Target Strength of a single link. Twenty-five individual links were then tested in a similar manner to confirm the results. Each link was tested from 0 to 360 degrees, in 45 degree increments. A range test was also conducted. The transducer was moved closer to the target to investigate the Scattering Strength and the number of scattering elements in the beam at various distances. This was done at normal incidence and at 45º oblique incidence. "The SURF program was a great way for me (as an incoming grad student) to get acclimated to CCOM and UNH before the academic year started. It really helped me avoid being overwhelmed at a new place. On a more technical note, I also thought it was a great experience.It kind of just dropped me right into my concentration before I even got to my graduate coursework, so I think I’ll likely do well when I get to Tom’s classes. On an interpersonal note, it was also very beneficial to participate in SURF. It’s not every day that one gets to work with such established professionals in their field, and I think I greatly benefited from those inter-actions. The other SURFers were great too...in fact, I still talk to Kurt and Eric regularly." The coastal morphology of Hampton-Seabrook Harbor of southern New Hampshire has changed significantly over the past 68 years as indicated in aerial imagery. The observed morphologic changes are likely related to natural progression of the system over time, storm events, and engineering alterations. There are three primary areas of interest to this study: (1) the Flood Tidal Delta, (2) the Middle Ground, and (3) the Ebb Tidal Delta. To better understand how the morphology of the system has changed with time and how engineering practices and/or storm events have impacted these three areas, a GIS analysis was carried out utilizing aerial photography that covers the period from 1943 to 2011. "The opportunity of having the Summer Undergraduate Research Fellowship through UNH at the CCOM last summer (2012) was an amazing experience, not just regarding the work that concerned my advisor and me, but all of the work occurring at the Center. It was a hub of innovation and thoughtful thinking geared toward the present and the future that really zdoes inspire. I have the utmost regard for those who I worked with and got to know, especially my fellow SURF members whom I can call my friends. I would recommend to anyone who has the opportunity to do a SURF with CCOM to embrace it because it is a wonderful opportunity that prepares you for future endeavors. Thank you very much to Dr. Tom Weber and Dr. Larry Ward for an excellent experience."